So it is summertime, and the supermarket and farmers markets are teeming with vibrant and fresh produce. Oodles of it. Mounds of it. Stone fruits and berries. Musky melons. Tender leafy greens. Sweet corn. Zucchini and summer squash. And tomatoes. Oh the tomatoes. And you get the picture. And I feel like I’m supposed to be turning this into salads, letting each piece of produce shine with little adornment, reveling in the joy that comes from eating food at its peak of flavor. I’m pretty sure it has been mandated that salads are supposed to be the thing you eat lots of in the summer. And I have maybe made maybe one salad so far? I’m not sure what the problem is. Perhaps rebellion? I have been doing the opposite, though, and turning veggies into oven fries! So here are green bean fries with a wasabi cream dip. Of course there would be a dip! Heat oven to 425. Bring a large pot of water to boil. Boil the green beans for 2 minutes then place in a bowl of ice and water to stop the cooking. Beat the egg and milk and place in a shallow bowl. In another shallow bowl, mix together flour, panko, salt, pepper, garlic powder and cumin. Coat each green bean first in the egg mixture and then the panko mixture. Place on a greased or lined baking sheet. Repeat for each green bean. Bake about 25 minutes, turning them over about halfway through so that they can crisp and brown on all sides. To make the dip, stir the sour cream, wasabi paste, and lime juice together and refrigerate until serving. psh who needs a salad when you can have THIS? :) sounds amazing! and I'm completely impressed that you got the breading to stick to the beans! Yum! I think this is a great way to fill up on summer veggies :) Looks great and that dip sounds awesome! One of my biggest weaknesses is French fries, so this seems like a good substitute! My other biggest weakness is Cheez-its (have been known to demolish a box in a weekend) and I spy you have a recipe in your Popular posts.... sooo... off I go to click! Thanks for the recipe! 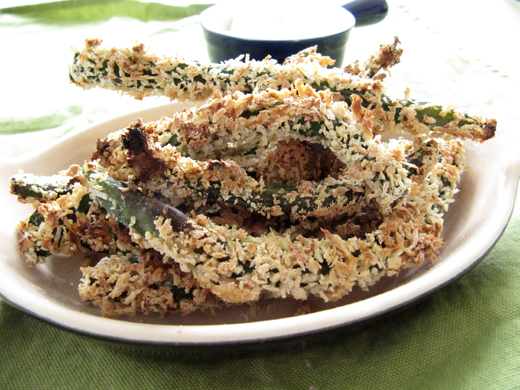 One of our favorite snacks are those fried green beans from TGIF that you buy in the store. So, I can't wait to start making them myself! OMG! I love panko crumbs and these look so savory and crunchy. I'd like some with the wasabi cream for lunch. These sound really interesting, I like the idea of the wasabi dip. The fries look addictive, especially with that wasabi dip! I've never tried doing this to green beans but you made it look so fantastic! What a great idea!The green beans look crispy and delicious! Gorgeous photo! I just love that panko against the green. Deliciously tempting and not even anything to feel guilty about despite that guilty pleasure of a word I love almost too much..."fries"! YUM! Totally a winner. I made so many plain veggies...boring. I love these gorgeous green beans! They look delish! This is an awesome way to use veggies! Love it. Looks like a great snack to add to summer barbecues! Plus I love the texture of panko breadcrumbs. Yummy! Oh I love these. Panko makes everything so lite and crunchy and you baked them too, healthy. Aw, don't you just love the taste of wasabi, for me the hotter the better. Great recipe. I am loving all the summer veggies too! Not many salads in my life either. I'd rather have these tasty green beans! Salads are overrated! These look fantastic. I"m so trying these!! I"ve been looking for app recipes for a dinner thing this friday and this would be so fun! Love the wasabi sour cream, this looks great! I'm definitely the only Japanese person you find who doesn't eat wasabi! I love the green bean panko oven fries though! My kids will eat ANYTHING that's fried and crispy, even though it's green vegetables! Great crispy topping for the fries!! I love it! And well paired with a wasabi sour cream. This is awesome. Super fun idea to bread all veggies and get people to eat them!